Its nearing the end of the game. The score currently stands 1-1 but your want to push for the win. You’ve got about 5 minutes left on the clock and you ask you players to push further up the field. Suddenly, the opposition break away on a counter attack and now its 3 attackers against the only 2 defenders you’ve asked to stay behind and cover the space. 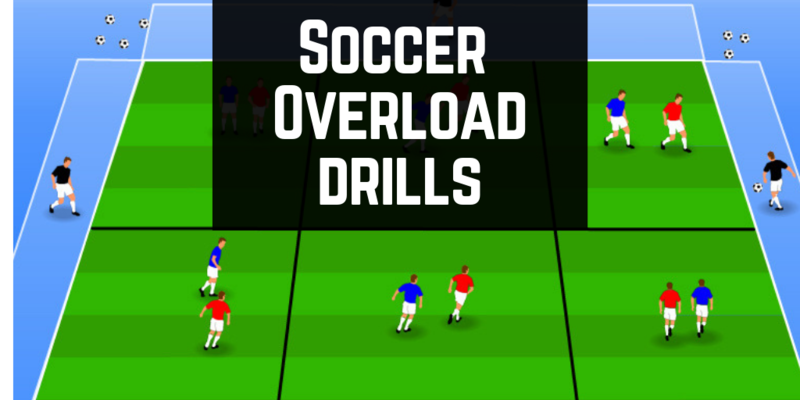 Soccer overloads are a brilliant way to recreate real-game scenarios by stacking the ‘odds’ for or against your players in different match-like situations. This ones a really simple setup that you can get going in a couple of seconds. It’s also easy to explain and even easier to add variations too. It’s also a great drill to use at the start of training as a warm up drill or can equally as effective at the end of a session. 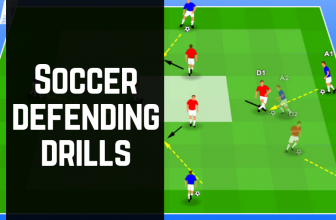 This drill is the perfect example of a ‘Simple Soccer Drill’ that’s effective and allows lots of room to coach your players. Each team must try an keep possession. Blues and reds are not allowed to leave their areas. Whites are allowed to float between areas to provide support. To create a competitive environment you can either give a point to each team that keeps possession and completes 5 passes (with every team member touching the ball at least once.). Alternatively you add some small goals in opposite corners. 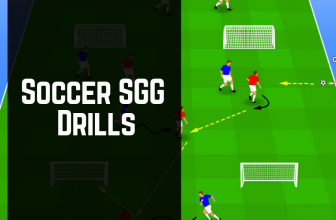 For this drill – split your group into 2 teams. Have the attacking team split into two further groups; one half opposite the goal and the other half entering from the side of the area of play. 1) Play starts by the attackers playing the ball into their team mates. 3) As the ball is played 1 defender enters the drills to create a 2v1 overload situation Attackers aim is to score past the keeper. If the defender wins the ball they are to aim for one of the 2 goals placed at the opposite end. 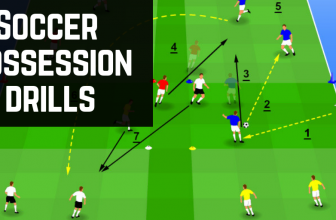 This will simulate real game scenarios as your defenders will have to look to pass the ball out of danger whilst under pressure. Variation #1: This drill can be turned into 3v1 and 3v2 overload by adding more players to the mix. Defenders will engage the attackers a defender in two’s while the attackers will come in waves of 4 players – creating a 4v2 attacking scenario. If the attacking team scores they stay on for another wave of attack, if they fail to score they rotate with the other attacking team. This is a great practice to get whole team of players involved in the same practice at the same time. Split 12 players into two teams of 6. Place your attackers (Blues) in the middle with a load of balls behind them. Then place your defenders (Reds) in front of and defending a goal. The drills starts with the blue players attacking the goals in a 1v1 scenario. 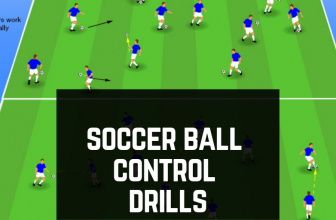 As the number of balls are reduced (through scoring and dead balls) the drill will naturally progress into various different overload situations. 2v1, 1v2, 3v2 etc. Variation #1: Change the amount of players you have setup from the start. Eg. 2:1 attacker to defender ratio. For this drill – split your group into 2 teams. 6 players stand at 3 starting positions at the top of the pitch. Each ‘wave’ of attack will involve 3 red players. They must work together to get past each of the marked area and it’s occupying defender. 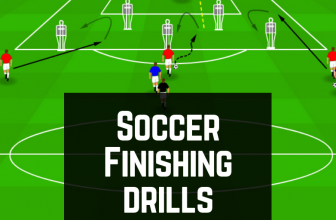 This is a great conditioned small sided game you can use at the end of your training practice. Set up two teams each with their own goalkeeper. 1) Blue defender passing the ball through to the midfield. 3) The first midfielder passes the ball to the supporting player. 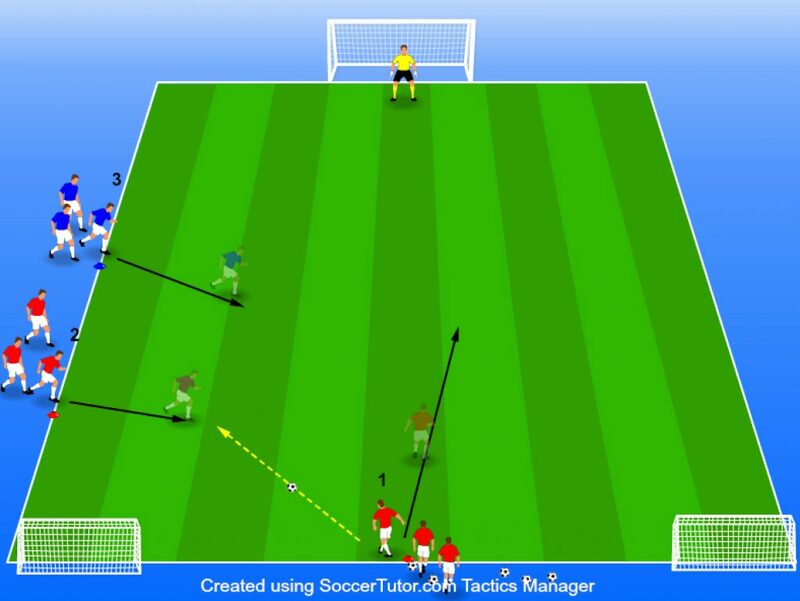 5) The non passing player runs into the attacking area to create 3v2 attacking overload. Variation #1: This can also be changed to a defending overload. Where the nearest defender to the ball makes the run into the next area to provide a 2v1 or 3v2 defending advantage. You’ll need to split your playing area up into a grid of 6 different areas. Outside these 6 areas you also need to mark out 4 target zone – one each side. Finally split your group into 3 teams. 1 Player from 2 teams will occupy a grid square each while the third team will take up a position each in the surrounding target zones. Each grid player plays in 1v1 scenario but the team in possession can use the outside target players as support creating either a 2v1 or 3v1 situation. And of course, each player can use the supporting player in a neighboring box to help keep possession. In order to score a point, if a player uses a target man as a support player, they then must get the ball out to the opposite target man to score a point for their team. Variation #1: You can limit the amount of touches taken to score a point. So eg; If a player uses a target man, then the team can only have a maximum of 5 touches before the ball gets to the opposite target player. Variation #2: You can also set a time limit to get the ball across eg; 5 seconds to move the ball across the opposite side to the target player.